Causes, symptoms and treatment of Gout and how to manage it. Gout is a type of arthritis that is caused by having too much uric acid in the joints. Uric acid is formed from the breakdown of purine, such as those found in purine rich foods. People who suffer from gout do not go through the body’s normal cycle of dissolving uric acid. Instead it remains in the body forming hard uric acid crystals that cause joint irritation and destruction. This results in pain and swelling, where tophi (swellings or sacks of uric acid crystals) may also be evident. It can affect any joint of the body but is more common in the weight bearing joints of the feet and more specifically the big toes. It is more prevalent in males who are overweight, drink alcohol or have high cholesterol and women who are post menopausal. Tinned fish (Anchovies, sardines, herring). Organ meat (liver, kidneys, sweetbreads). Certain medication (diuretics, aspirin, niacin, cyclosporine) and drugs to treat cancer. Quick onset of pain within hours. Difficulty weight bearing on the affected area. Localised redness, swelling, heat, intense pain if touched. Wounds may occur if severe and a toothpaste like discharge may be evident. Review of current medications by GP. Reduce alcohol intake and drink plenty of water. Specific medication for acute attacks. Long term preventative medication (Pro-gout, Allopurinol). Please note: If you do not seek treatment for this condition you may continue to get attacks where the duration of your attacks may be longer and affect more joints. 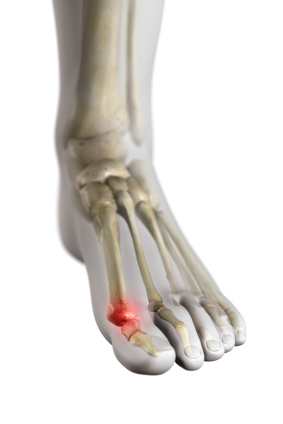 Long term gout without treatment can lead to kidney stones, arthritis and deformed joints. Supportive footwear and orthotic therapy can help support painful joints and prevent further irritation and discomfort. Well Heeled Podiatry can professionally assess and diagnose the reason for your joint pain and provide you with an appropriate treatment regime.